Tab page "Asset Files" - FilePathFinder Pro Tab page "Asset Files"
: do not copy the file and set the link to existing file in the collecting folder. : copy and rename the file automatically. : display a dialog with ability a choise of action. 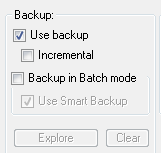 : keep a copy of the file in the folder "Autoback\FPF_Batch_Backup"